When it comes to functionality in accessories, sunglasses are near the very top of the list. Whether I’m seeking shield from the sun or simply trying to hide my tired eyes, I always keep a pair of sunglasses in my purse. And during these warm-weather months, a good pair is absolutely essential. The good news is that there’s plenty of styles to choose from. 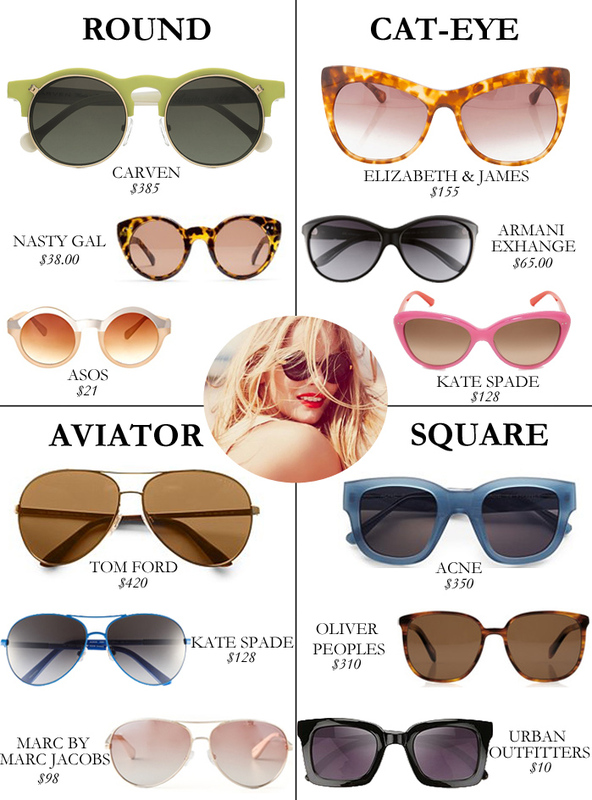 According to the experts, you’re supposed to choose a pair of sunglasses according to the shape of your face shape. I have absolutely no idea what my face shape is (oval? oblong? ), but I’ve noticed I tend to opt for sunnies with rounder edges. (I steer clear from square-shaped. Those just don’t seem to work for me.) It’s fun to see all of the different eyewear trends that emerge, but I always go back to the classics. Lately, I’ve been alternating between my Celine “Audrey” sunglasses and these Ray-Ban aviators. Wow, I think that Elizabeth & James cat-eye might be calling my name! So cute. Great picks! I am in need of some new sunnies for summer =) Thank you for the inspiration! I am loving the aviators and the cat eyes. Great pics! Love all of these. I'm a huge fan of round frames and the cat eye ones. My faves are aviators and cat eye! 🙂 Nice picks!! I love those pink Kate Spade cat eye ones but I hunk aviator looks best on me. Such a fun roundup! LOVE all your choices, my friend has the Elizabeth & James ones in black and I tried them on this weekend- even cuter in person, might need to scoop these up! I still think I like the aviators the best…but they are all so lovely. 🙂 Happy Monday Bradley! elizabeth & james takes the cake! love them. xo. I will take the round and the cat eye ones. Great selection. I typically rotate between my Ray Ban aviators and a pair for square Fendi sunglasses I have but I'm so tempted to throw in a cat-eye pair into the mix! They're just so fun. Love the Marc by Marc Jacobs aviators! I love the cat-eye shapes sunnies. So retro and chic!